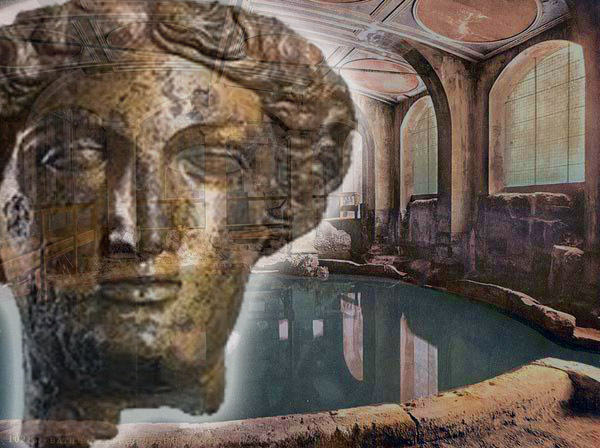 Sulis (Sul, Sulei, Sulla) is Celtic-Roman goddess known primarily from Bath, England (originally Aquae Sulis), now in Sommerset, where 38 inscriptions dedicated to her have been found. She is assciated with the Roman Goddess, Minerva and at Cirencester she is invoked in the plural form (Suleviae), linked to a good many widely revered divine mothers, who frequently appear with two or three primary aspects to their character. Her iconography is that of a solar deity, but she is a healing goddess, associated with hot springs and healing waters. Sulis’s name come from a root meaning “eye” or “gap”, referring both to the spring from where half a million gallons of hot water still well up every day, as well as to Her powers as seeress. I evoked Sulis after having had a very difficult decline with my health. The stuggles were becoming more than I could bare and I desperately desired to feel healthy once again. I was waiting for a kidney transplant for over 5 years and once I was blessed with a new kidney, my focus became protection. I wanted to not only rebuild my life, but also restore my physical self to ensure a long, healthy future for this new kidney. That is when I evoked Sulis. You see, the key to prolonging a transplanted kidney is not just to take your meds and take care of your body, but to drink plenty of fluids, specifically water. And after more than 6 years on dialysis and unable to ingest large quantities of water, I feared that I would not be able to drink the required amounts of water necessary to maintain this kindey’s function at its peak. Sulis, the goddess of healing waters was just the divine essence I needed to help me though this journey. With her healing waters I not only cleansed myself externally but also from within. In less than 3 months, I was taken off most of the medications, and was given a new clean bill of health. It was as if this new kindey and I were destined to be together. The Goddess Sulis says that the ways you manage your energy can mean the difference between illness and wellness. Illness is the time to direct the flow of energy inward; wellness is the time for energy to be focused outward. Hail Sulis, Goddess of Healing Waters! This entry was posted in Divine Awakenings and tagged Celtic, divine, goddess, healing, invocation, kidney, Roman, springs, Sulis, transplant, water. Beautiful article about Sulis, thank you! I found you when i was researching the Goddess. I take the liberty of using your image on my blog, and will give all links.